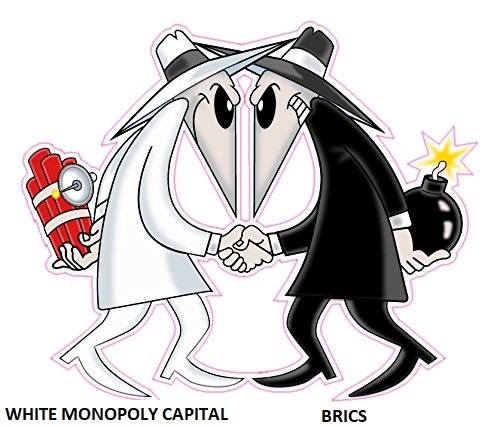 In the luxurious central business district of Sandton, a large gathering of state-funded intellectuals (staying at the 5-star Intercontinental Hotel) is conferencing in heart-warmingly hedonistic style, replete with national Brazil–Russia–India–China–South Africa songs and dances. The mandate from Higher Education and Training Minister Naledi Pandoor’s opening speech was framed with unabashed talk-left ideology, regardless of obvious walk-right realities. In another example of dubious Sandton scholarship, one of South Africa’s most insightful tech analysts, Rasagan Maharajh from Tshwane University of Technology, has gone on record advocating a BRICS alternative to the Western-controlled internet, albeit with not a single mention of Beijing’s extreme surveillance, censorship, active net repression and official Orwellian ‘social credit’ attempts at citizens’ behaviour modification – the latter carried out by Tencent, in which the Sandton scholars have made large investments (as have all of us with Johannesburg Stock Exchange pension portfolios, via Naspers). •	higher levels of high-emissions meat consumption plus higher pesticide and fertiliser use.